The present day Christchurch Cathedral was founded over 1000 years ago by King Sitric, who was the Viking King of Dublin at the time. Since then, it has seen numerous changes through the passage of time and momentous events that changed the course of Irish history. Archbishop Laurence O’Toole, the patron saint of Dublin interceded with Stongbow, for peace when the city was captured by the anglo-normans in 1170, who replaced it with a Romanesque cathedral. King Richard II sat in state there to receive homage from othe High Kings of Ireland's four provinces and Lambert Simnel 'pretender' to the English throne was even crowned in Christchurch Cathedral in 1487. Continuously steeped in history, Henry VIII himself appointed Robert Castle the first Dean in 1541. However in 1562 the nave roof vaulting collapsed, necessitating 'emergency’ repairs which lasted until the mid 19th century. King James attended Mass there before being famously defeated by King William of Orange (Billy) at the Battle of the Boyne in 1690, who presented a set of priceless silver gilt communion plate to the cathedral in recognition of his great victory. Which is now on display in the Crypt below Christchurch Cathedral (which is the largest in Britain and Ireland and the oldest building in Dublin) as part of the Millennium Treasures Exhibition. Priceless silver artefacts are on display alongside interesting headstones and the famous mummifed 'cat and mouse' who got 'caught' once upon a time in an organ pipe. 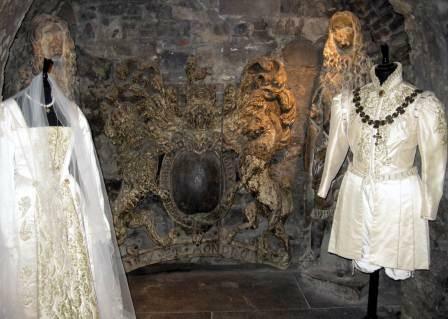 And, in celebration of the recent royal weddings, there are two costumes on loan from the very popular Tudors televison series, by Oscar winning Irish designer Joan Bergin. The Stuart coat of arms (behind them) was relocated here for safekeeping when the Tholstel (the then city hall) was demolished in 1806. 2 Have a pint in the Brazen Head Pub, which hosts great story telling sessions nightly, down the hill or the Lord Edward across the road on the corner, opposite the cathedral, both very old Dublin pubs. 3 Stroll through The Liberties so called because it was a tax free zone in Medieval times, enjoy the banter of the street traders. 5 See the oldest flats in Dublin the Iveagh Mansions where many famous Irish people where born and bred, including actress Brenda Fricker, comedian Brendan Grace and singer Imelda May. 6 Have a rest for yourself in the quiet park beside St Patrick's Cathedral at the bottom of Thomas Street. 7 Steep yourself in antiquity in Marsh's Library just around the corner from the entrance to St Patrick's Cathedral. 8 Or visit the Iveagh Gardens another idyllic park off Harcourt Street not many people know about other than the locals. 9 Say a prayer to St Valentine in Whitefriar St Church. 10 Visit Dublin Castle and Chester Beatty Library . 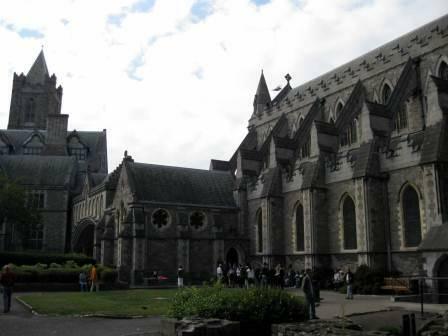 For more information on Christchurch Cathedral please click here.